As part of adaptive immunity, T cells play an integral role in executing and controlling immune responses. T cells can be distinguished from other lymphocytes, such as B cells and natural killer (NK) cells, by the presence of a T-cell receptor on the cell surface. Each of the various T cell subsets has distinct functions and aids the immune response to achieve best efficacy. Maturing from thymocytes, T cells undergo several development stages: After selection in the thymus, they circulate the body as naïve T cells, each with a unique antigen-specificity. Upon antigen encounter, they are activated, differentiate into a specific subtype, expand and fulfill their role as effector cells, e.g., by migrating into various tissues and organs. For long-lasting immune memory, some of the antigen-activated T cells differentiate into various memory T cell subtypes. A typical mouse spleen weighs between 80 and 120 mg and contains up to 1´108 splenocytes. T cells constitute roughly 25% of all splenocytes, with the CD4+ T cells accounting for approximately two thirds of the total T cell population, and CD8+ T cells making up the remaining one third. Cell numbers in lymph nodes vary, but up to 80% of the total lymph node cell population are T cells, again with a CD4+:CD8+ T cell ratio of 2:1. Cells in the thymus of a young mouse, however, may be over 90% T cells, most of them in a double-positive stage, expressing both CD4 and CD8. *Frequencies depend on mouse strain, age, gender, and environment. Spleen values are expressed as percent of total splenocytes. The range of functionally diverse T cell subtypes can be divided broadly into CD4+ T helper cells, CD8+ cytotoxic T cells, CD4+CD25+FoxP3+ regulatory T cells, and the 'unconventional' T cell subtypes, such as γ/δ T cells and NK T cells. Thus, T cells are typically identified by their expression of CD3 together with either CD4 or CD8. An exception are thymocytes, which can be double-negative or double-positive for CD4 and CD8, depending on their developmental stage. Based on the subtype of interest, additional markers are used to further differentiate T cells. Most T cell subtypes can undergo several differentiation steps after activation by their respective antigen. Apart from differentiating into effector T cells, some naive T cells (TNAIVE) may differentiate into various memory T cell subsets, including stem cell-like memory T cells (TSCM), central memory T cells (TCM), and effector memory T cells (TEM). Each subset is defined by distinct surface markers. Antigen-inexperienced T cells express homing receptors CD62L and CCR7, but lack expression of activation markers CD44 and CD95. With ongoing differentiation towards the memory phenotypes, CD62L and CCR7 are downregulated, while CD44 and CD95 are gradually upregulated. With progressive differentiation towards the memory phenotype, antigen-dependency, tissue tropism, effector function and senescence increase (PMID: 24258910, 26999211). Shared features of all memory T cell subtypes are that they are long-lived and can quickly expand to large numbers of effector T cells upon re-exposure to their cognate antigen, thereby mounting a faster and more potent immune response than the first immune response to a given pathogen. The different subtypes exert different functions and exhibit different properties, such as tissue tropism or capacity for self-renewal, reflecting the specific immune-related circumstances that led to their differentiation into a given memory subtype. Overview of mouse T cell differentiation from naive to memory T cells (PMID: 24258910, 26999211). Overview of mouse T cell differentiation from naive to memory T cells. 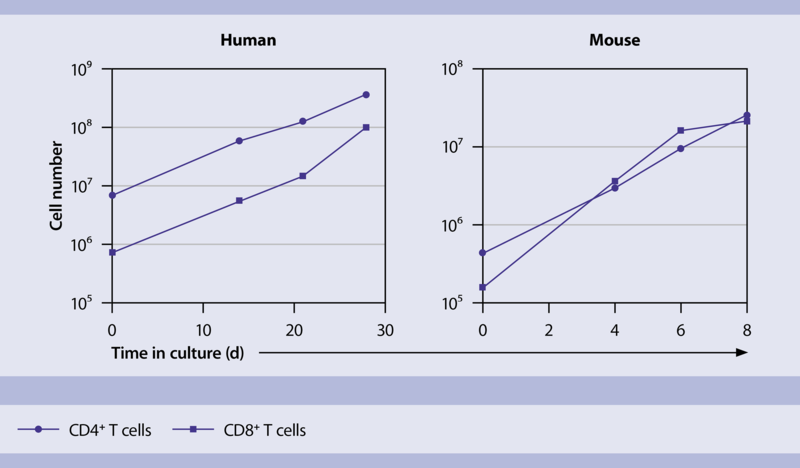 Typically, the frequency of naïve T cells specific for a given antigen is very low, ranging between 0.01 and 0.001% of the total T cell count, depending on the respective specificity. When a naïve T cell encounters its cognate antigen and is consequently activated, clonal expansion begins, boosting the frequency of those antigen-specific T cells by several orders of magnitude. This way, they can efficiently fulfill their role as effectors in the immune response (PMID: 22517866, 17707129). Most clonally expanded antigen-specific T cells die after the termination of the immune response, but a small percentage survive as memory T cells. Memory T cells have a long lifespan and can quickly expand to large numbers of effector T cells upon re-exposure to their cognate antigen. At birth, the T cell repertoire is almost exclusively composed of naïve T cells. With progressing age and antigen-experience, memory T cells may become the most abundant T cell population, constituting up to 35% of all circulating T cells (PMID: 24336101). Notably, laboratory mice carry almost exclusively naïve T cells due to their specific holding conditions and relatively young average age. This, of course, changes dramatically in certain disease-related experimental settings. In humans, the frequency of naïve and memory T cells greatly depends on age, living conditions, and individual history of immune responses. Miltenyi Biotec has created dedicated application protocols for the isolation of different pan T cell subsets. The main source for mouse T cells are single-cell suspensions from spleen and lymph nodes. The tissue must be dissociated into a single-cell suspension for many downstream applications, including isolation of cell subpopulations, cell culture, or flow cytometry analysis. Dissociation can be accomplished fully automatically using the gentleMACS™ Dissociator and specific Tissue Dissociation Kits (e.g., Spleen Dissociation Kit, mouse). A special protocol for the preparation of single-cell suspensions from mouse spleen without enzymatic treatment can be downloaded from the Related Resources panel to the right. Alternatively, tissues can be dissociated using a manual procedure. For further details, see the MACS Handbook chapters spleen and lymph node. Miltenyi Biotec has developed numerous products for the efficient magnetic separation of T cells in single-cell suspensions generated from spleen and lymphoid tissue. For details on MACS® Cell Separation Technology, see the MACS handbook chapter Magnetic cell separation. The Pan T Cell Isolation Kit II, mouse was developed to isolate untouched mouse T cells from single-cell suspensions of spleen or lymph node tissue. The kit is based on a cocktail of biotin-conjugated antibodies against CD11b, CD11c, CD19, CD45R (B220), CD49b (DX5), CD105, Anti-MHC-class II, and Ter-119, and the isolation is achieved by depletion of magnetically labeled non-target cells. Depletion-based T cell separation from mouse spleen. A single-cell suspension of mouse spleen was prepared using the program m_spleen_01.01 on the gentleMACS Dissociator. T cells were isolated using the Pan T Cell Isolation Kit II, mouse, an LS Column, and a MidiMACS™ Separator. Cells were fluorescently stained with the MC CD90.2 T Cell Cocktail, mouse, as well as CD3ε-APC and analyzed by flow cytometry on the MACSQuant® Analyzer. Cell debris and dead cells were excluded from the analysis based on scatter signals and propidium iodide fluorescence. Additional kits and reagents can be used to isolate T cells from any mouse tissue, including spleen and lymphoid tissue. For example, depending on marker of choice, the CD3ε MicroBead Kit or the CD5 (Ly-1) MicroBeads, mouse can be used for positive selection of Pan T cells from single-cell suspensions. CD90.1 MicroBeads, mouse and rat, and CD90.2 MicroBeads, mouse enable positive selection or depletion of T cells from single-cell suspensions of lymphoid and non-lymphoid tissues or from peripheral blood, leveraging these mouse strain-specific cell markers. CD90.1 MicroBeads react with rat CD90 (Thy-1) and mouse CD90.1 (Thy1.1), which can be found on thymocytes, bone marrow hematopoietic stem cells, intraepithelial cells (dendritic epidermal cells), and neurons like retinal ganglion cells. Use these MicroBeads for mouse strains AKR/J, PL, and FVB/N. The antibody does not cross-react with CD90.2 (Thy1.2). The mouse CD90.2 alloantigen, also known as Thy1.2, is a pan T cell marker for the most common inbred mouse strains, including BALB/c, DBA, CBA/J, C3H, C57BL/6, NZB/–, and S3L. CD90.2 is expressed on thymocytes, peripheral T cells, on some intraepithelial T cells, and at lower levels on early hematopoietic stem cells in bone marrow. The mouse CD90.2 antibody does not cross-react with CD90.1 (Thy1.1). Note that CD90.1 MicroBeads can be used to isolate T cells for the adoptive transfer of CD90.1+ T cells into CD90.2+ inbred strains or immunodeficient mice. The CD62L MicroBeads, mouse are ideal to either enrich or deplete certain T cell subtypes based on their CD62L expression, which allows subsequent analysis of specific cell subsets within the pan T cell population. CD62L is highly expressed on naive T cells and then downregulated upon activation. It is also expressed by central memory T cells, which can be distinguished from naive T cells by their high expression of CD44. Furthermore, CD62L is expressed on most thymocytes, naive cytotoxic T cells, B cells, dendritic cells, macrophages, NK cells, neutrophils, and eosinophils. Combined with pre-enrichment via the CD4+ T Cell Isolation Kit or the CD8a+ T Cell Isolation Kit, the CD62L MicroBeads enable isolating the respective naïve and central memory T cell subpopulations. T cell activation can be either antigen-specific, by recognition of the cognate antigen, or polyclonal via, e.g., antibody-mediated CD3/CD28 ligation or binding of chemical agents like PMA/ionomycin. T cell activation is characterized by upregulation of surface markers and the expression of pro-inflammatory cytokines. Depending on the T cell subtype and the activation-mode, activation markers include CD25, CD44, CD69, CD137, CD154, and KLRG1, as well as IL-2, IL-4, IL-5, IL-6, IL-9, IL-13, IL17, TNF-α and IFN-γ. Also the downregulation of homing markers like CD62L can be a reliable signal of T cell activation. For details on using these markers to identify activation T cells, see Characterization of T cells by flow cytometry. Antigen-activated T cells are especially interesting for research on specific immune-responses. Expression of CD137 and CD154 are described as a reliable marker for antigen-activated T cells and can be used for analysis and enrichment of those rare cells using the CD154 Enrichment and Detection Kit (PE), mouse. Enrichment of CD154+ T cells. Antigen-specific CD154+ T cells were enriched using the CD154 Enrichment and Detection Kit, two MS Columns, and a MiniMACS™ Separator. To that end, spleen cells from a KLH immunized BALB/c mouse were incubated with the CD154 Detection Cocktail (PE) for 6 hours and concurrently restimulated with 100 μg/mL KLH or left unstimulated. The CD154+ T cells were magnetically isolated using Anti-PE MicroBeads UltraPure, and were fluorescently stained with CD4-FITC and CD45R (B220)-PerCP. Cell debris and dead cells were excluded from the analysis based on scatter signals and propidium iodide (PI) fluorescence. CD45R+ cells were also excluded from the analysis. Secreted cytokines can be used either as markers for antigen-activated T cells, or as a means to isolate and analyze of these cells. For details, see Analysis of surface markers and cytokines. Gamma delta T cells (γ/δ T cells) have a distinctive T-cell receptor (TCR) on their surface that consists of one γ (gamma) chain and one δ (delta) chain, as opposed to the 'conventional' αβ (alpha beta) T cells that express a TCR composed of α and β TCR chains. Since most T cells are αβ T cells, γ/δ T cells are relatively rare (<3% of all T cells in spleen; <1% of all splenocytes), showing highest abundance in a population of lymphocytes of the gut mucosa known as intraepithelial lymphocytes. The antigens that activate γ/δ T cells and their specific function are still largely unknown. They recognize antigens without the presence of major histocompatibility complex (MHC) molecules, are able to function as antigen-presenting cells, and they exhibit cytotoxicity. This makes them ideal candidates as therapeutic targets to induce durable immunity in the context of different pathologies. Their functional responses are induced upon recognition of stress antigens, such as heat-shock proteins, which promotes cytokine production and regulates various stages of the immune reaction in response to stress. Thereby, γ/δ T cells can attack target cells directly through their cytotoxic activity or indirectly through the activation of other immune cells. The TCRγ/δ+ T Cell Isolation Kit, mouse, contains CD11b and CD45R (B220) MicroBeads for depletion of CD11b+ and CD45R (B220)+ cells, as well as Anti-TCRγ/δ-Biotin and Anti-Biotin MicroBeads for positive selection of TCRγ/δ+ T cells. Efficient isolation of γ/δ T cells. TCRγ/δ+ T cells were isolated from single cell suspensions of mouse spleen and lymph node using the TCRγ/δ+ T Cell Isolation Kit, mouse, an LD and two MS Columns, a MidiMACS and a MiniMACS Separator. NKT cells express an α/β T-cell receptor, but also a variety of molecular markers that are typically associated with NK cells, such as NK1.1. The best-known NKT cells differ from conventional α/β T cells in that their T-cell receptors are far more limited in diversity ('invariant' or 'type 1' NKT). However, also other CD1d-restricted T cells ('type 2' NKT) recognize lipids and glycolipids presented by CD1d molecules, rather than peptide-MHC complexes. NKT cells include both NK1.1+ and NK1.1−, as well as CD4+, CD4−, CD8+ and CD8− cells. Natural killer T cells may share other features with NK cells, such as CD16 and CD56 expression and granzyme production. The NK1.1+ iNKT Cell Isolation Kit, mouse was developed for the separation of mouse iNKT cells from spleen and lymphoid tissue. Isolation of iNKT cells. Splenocytes from a C57BL/6 mouse were processed with the NK1.1+ iNKT Cell Isolation Kit, an LD and two MS Columns, a MidiMACS and a MiniMACS Separator. The isolated cells were fluorescently stained with Anti-NK1.1-APC, CD3ε-VioBlue®, and α-Gal-Cer/CD1d Tetramer-PE ,and then analyzed by flow cytometry using the MACSQuant Analyzer. Cell debris and dead cells were excluded from the analysis based on scatter signals and propidium iodide fluorescence. T cells and their differentiation status can be determined by flow cytometry based on their expression of cell surface markers, transcription factors ,and the cytokines they produce. Miltenyi Biotec offers a vast portfolio of conventional and recombinant REAfinity™ antibodies and flow analysis kits for comprehensive analysis. MACS Cytokine Secretion Assays allow detection and enrichment of viable cytokine-secreting cells. The mouse kits are available for a large number of cytokines, including IFN-γ, IL-2, IL-4, IL-5, IL-10 and IL-17, and can be used for further characterization of T cell subsets. The mouse MACSPlex Cytokine 10 Kits are used for multiplex analysis of secreted cytokines in serum and cell culture supernatants using a standard flow cytometer. Cytokines that can be analyzed in a single sample include: GM-CSF, IFN-γ, IL-2, IL-4, IL-5, IL-10, IL-12p70, IL-17A, IL-23, and TNF-α. The MACSPlex Cytokine Kits enable multiplex analysis of secreted cytokines in cell culture supernatants, among other fluids, via flow cytometry. 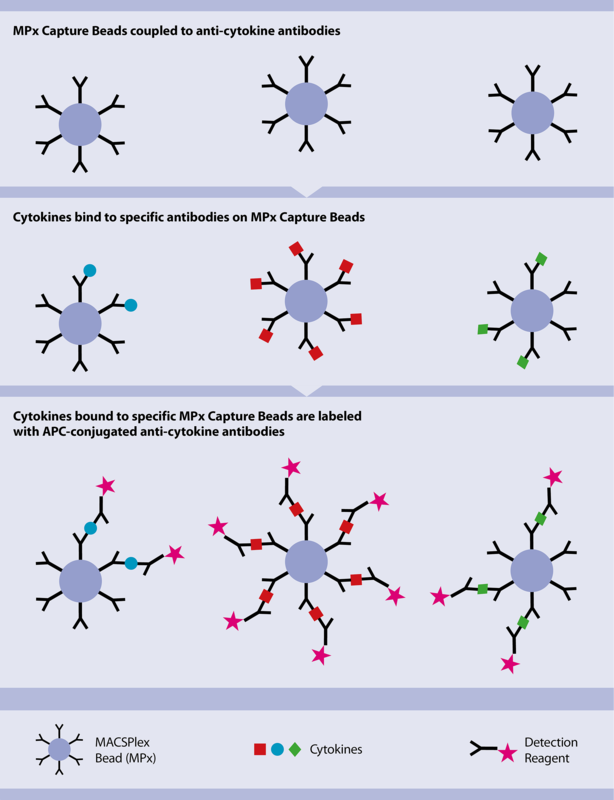 Several cytokines can be analyzed in a single sample. Miltenyi Biotec offers high-quality recombinant cytokines for cell culture, as well as reagents for polyclonal stimulation, such as the T Cell Activation/Expansion Kit, mouse. This kit employs large, cell-sized particles loaded with biotinylated antibodies to activate and expand primary cells. The particles mimic antigen-presenting cells and, when loaded with CD3 and CD28 antibodies and applied in a specific bead-to-cell ratio, lead to efficient T cell activation. Different T cell Activation/Expansion Kits are available for the stimulation of T cells as well as Tregs with mouse, human and non-human primate origin. Efficient expansion of T cells. Expansion rates of human and mouse CD4+ and CD8+ T cells over the course of several days after activation and expansion with the respective T Cell Activation/Expansion Kit. Expansion rates of human and mouse CD4+ and CD8+ T cells over the course of several days after activation and expansion with the respective T Cell Activation/Expansion Kit. MACS Cytokines are available in three different grades – research, premium, and MACS GMP grade – to provide best flexibility in any assay setup. Notably, premium-grade MACS Cytokines exhibit well-defined biological activities, normalized to international reference standards (IU/mg), that allow exact unit dosing for reproducible results without laborious pre-testing. Finally, the antibodies CD3e and CD28 pure – functional grade, mouse are suitable for in vitro T cell activation and expansion. The CD3e (145-2C11) and CD28 (37.51) antibodies recognize the respective mouse receptors. Via receptor binding, a stimulatory signal is transferred that, in combination with additional cytokines (e.g., IL-2), leads to the activation and expansion of T cells. Mouse T cells can also be obtained from non-lymphoid tissue. Miltenyi Biotec offers a variety of solutions for the preparation of non-lymphoid mouse tissue as well as the subsequent separation, cultivation, and analysis of the respective T cell populations. Overview of surface markers to analyze mouse T cell tissue tropism. Depending on the respective organ and the inflammatory context, T cell frequencies are highly variable in non-lymphoid tissue. Furthermore, T cells vary in the expression of certain surface markers, such as homing receptors, adhesion molecules, and chemokine receptors, with regards to their tissue tropism. Although the expression of those markers somewhat depends on the specific T cell subtype and differentiation status, certain receptors, especially in memory T cells, can be defined as hallmarks for tissue tropism. 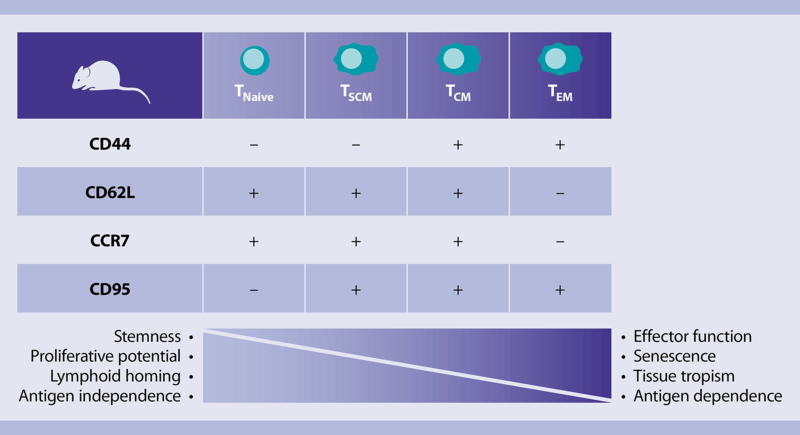 For flow cytometry analysis of tissue-derived T cells, Miltenyi Biotec offers comprehensive panels of antibodies corresponding to the markers indicated in the table above. Tissues must be dissociated into a single-cell suspension for many downstream applications, including isolation of cell subpopulations, cell culture, or flow cytometry analysis. The combination of mechanical dissociation and enzymatic treatment based on the gentleMACS Dissociator with Heaters and specific Tissue Dissociation Kits enables reproducible T cell isolation. T cells can be obtained with excellent yield, high viability rate, and preserved cell epitopes even from hard-to-process tissues, including lamina propria, lung, liver, and tumor. For more information, see the products for sample preparation and the MACS handbook chapter mouse cell sourcec.